As I noted in a previous post, it is clear that a large part of the Syrian violence is essentially a sectarian civil war between Alawites and Sunnis. 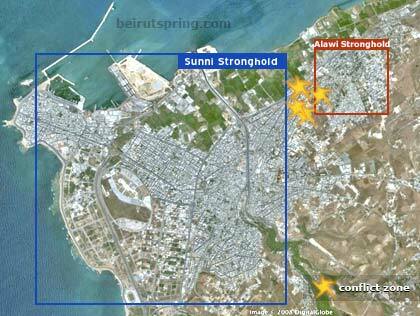 Now it appears as though the Alawite-Sunni conflict has hopped across the border into Lebanon. According to an article in the BBC, Lebanese Sunnis and Alawites have clashed in the northern Lebanese city of Tripoli. According to the BBC, the fighting was taking place largely in Tripoli's Bab al-Tebbaneh district, a mostly Sunni Muslim community, and the pro-Damascus Alawite Jabal Mohsen neighbourhood. So far, 10 people have died and the Lebanese government has sent security forces into Tripoli to try to contain the fighting. "The Alawites," he says, referring to the sect to which many of the senior echelons of the Assad regime belong, "they are apostates - and they are killing Muslims all over Syria." Clearly, the sectarian conflict between Alawites and Sunnis in Syria is now being echoed in Lebanon. Here is the most recent BBC article, as well as the one from several weeks back.